These days everybody makes the same excuse: “I don’t have time to exercise”. But the truth is that even the busiest businessman can make time to exercise—and many of the most successful business people are actually fitness fanatics, getting out of bed to exercise well before your first alarm goes off. They know that the time they commit to exercise each day will save them a lot of time in the long run and even add extra years to their lives. Of course, not everyone is capable of waking up at 4 or 5AM to exercise, but no matter how busy you are I can guarantee you can find time to exercise. Instead of one never ending to do list, create three separate lists: one for work, one for yourself and one for your family(or anything else you want to dedicate a significant amount of time to). Now list the 3 most impactful things you can do to move forward in each area. Exercise should go into the “yourself” category, along with other nurturing activities like learning something, reading for pleasure or catching up with a close friend. As for all the other tasks you’d like to complete, those can be added to your to do lists once you’ve accomplished the first three items in each category. Of course, exercise should always be on the list so you can maintain your fitness once you’ve achieved it. Just like an entrepreneur makes a business plan, you should create a fitness plan. The simple act of writing down your fitness goals and how you’re going to get there makes them more concrete in your mind, making you more likely to complete them. Your fitness plan doesn’t have to be elaborate, but it does have to be specific, especially about the time. You should be scheduling exercise the same way you would schedule a business meeting: at a specific time, on specific days and in a specific place. Scheduling specific days for cardio and other days for strength training is a great idea but don’t feel like you have to schedule exact exercises. Giving yourself a little bit of freedom to choose exact exercises when you get to the gym(or wherever you exercise) may help you actually enjoy your workouts. 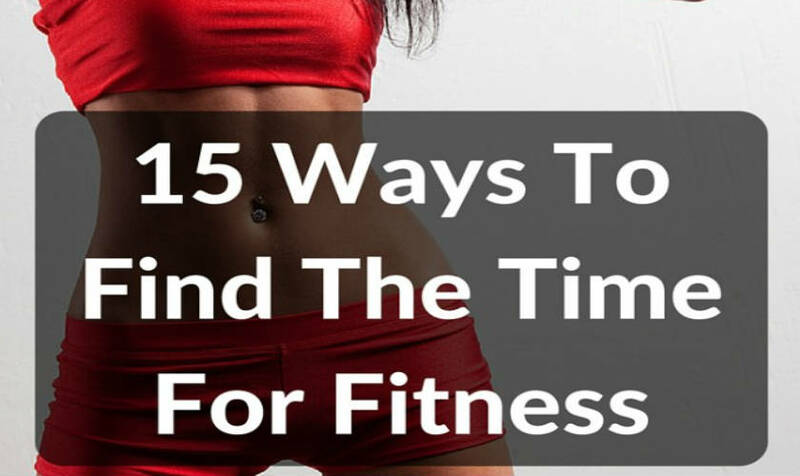 Looking at your schedule and wondering where you’ll ever find time for a consistent workout routine? Here’s a little secret: you don’t have to start with an hour or even a half hour long session. You can start with five, ten or fifteen minutes. Anyone can find five minutes to take for themselves. Use those five minutes to exercise instead of checking your phone. Five minutes a day won’t make you fit on its own, but I’d be willing to bet you can find another five minutes later in the day. If you pay a lot of attention you might be able to find several five minute chunks of time you can use to exercise. Once you’ve been taking your five minutes regularly you’ll also find it easier to extend that time period into ten, fifteen, twenty minutes. By adding five minutes every month you’ll be doing half an hour every day before the year is up. You don’t have to give up your favorite shows to get fit. Many exercises can be done while you’re watching TV—even if you’re watching without commercials. Commercials are a great time to do intense intervals of cardio training, but with a pair of dumbbells or resistance bands you can easily do exercises while your show is actually on and not miss a thing. If you have to go out of your way to exercise you’re a lot less likely to do it. Invest in some simple fitness equipment to keep around the house for days when you really can’t make it to the gym. A jump rope, some resistance bands and a set of adjustable dumbbells will cost you around $100 total and make it possible to do dozens of exercises in the comfort of your own house. Thinking about how busy you are and how little time you have only stresses you out and takes up more of your time. Deliberately challenge every negative thought you have about exercise by following it with a positive thought. Try to make positive identity statements about yourself as well—”I do exercise” “I am constantly improving my fitness” “I make time to improve my health”. Recent research has shown these identity statements to be even more powerful than regular positive thinking. Next time one of your friends or family members wants to get together for lunch, why not suggest you do something active together too? A hike is a great way to get in some exercise while being able to maintain a conversation. You can also bond by trying out a new physical activity together such as rope climbing. Pro tip: this works on dates too, and doing new activities together is one of the best ways to build or keep romance in a relationship. Working out should feel like work because your muscles are working hard, not because your mind is working hard to stay interested. Just because your best friend loves to run does not mean you should become a runner. When you first start working out try as many different things as you can to figure out what you actually enjoy. You might be happy to spend entire days climbing rock walls or playing casual sports. Find something you enjoy and it’ll suddenly be a lot easier to make time for exercise. Going on a big business trip or vacation? Bring your resistance bands and jump rope with you to get in some exercise. Many hotels will also have gyms and swimming pools you can use to get an excellent workout. Many of your coworkers and clients are probably also struggling to find time for exercise in their daily routines. Consider asking them to do something active with you while discussing business—and you don’t have to go for the stereotypical golf. Going for a brisk walk, especially if you’re walking through a park, will help you both stay alert and focused as well as providing some good exercise. Workout DVDs allow you to stop and start your workout around real life time constraints and give you a specific exercise routine to follow. They’re also a lot more cost effective than a gym membership or classes. A cheerleader—or even better, an exercise partner—can be just about anyone, so long as they’re willing to cheer your accomplishments and encourage you to stick with your exercise routine even when the going gets tough. If you can cheer them towards their own fitness goals, even better. Not comfortable asking somebody you know personally? There are plenty of online forums where you can find people willing to celebrate your accomplishments with you, so long as you’re willing to celebrate theirs too. Delegation is a successful businessman’s best friend. Never fall into the trap of believing you have to do it all yourself. Not only are the people around you perfectly capable of helping, if you ask nicely they will almost always be happy to help you with whatever it is. If you’re really not comfortable asking someone you know personally for help, hire somebody to do it. And remember, you can delegate pretty much anything, whether it’s some kind of housework or something to do with your actual job. If you’re one of the many people who spends a large chunk of their day sitting at a desk and staring at a computer you should deliberately limit the amount of time you spend staring at computer or TV screens when you get home. Being an active watcher is great but limiting your screen time altogether will give you time to do all the other things you love. Turning off the TV earlier will also improve your length and quality of sleep later. How much do you actually have to do on any given day? Do you ever find yourself wasting time? Are there shows you watch that you don’t absolutely love? People you’re not sure you want to be friends with anymore? Cut it all out. With all the things you legitimately have to do and your personal fitness goals you do not have any time to spend on these things. With all the demands placed on us today and so many different forms of media competing for our attention it can feel impossible to find time for a good workout but if you actually pay attention you’re sure to find small chunks of time you can carve out for fitness. One thing’s for sure: you will spend a lot of time and money on doctor’s visits in the future if you don’t make the time to become healthy now.